Jessica Kruger’s gorgeous face became the favorite in online voting for a campaign to find the new spokesperson for a perfume company. The 21-year-old quadriplegic sees the modeling contract as an opportunity to educate the public. She entered the “Something Sweet” campaign by the Lise Watier company upon the urging of a friend “just for fun”, but decided that the voting could help change the world’s perception of beauty. 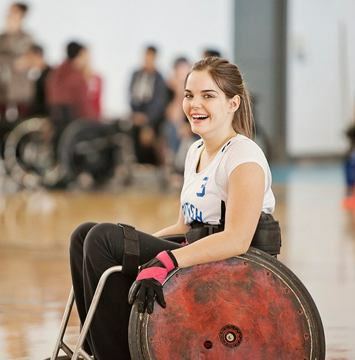 Now a student at Simon Fraser University, she fell from a ladder when she was 15 and lost all use of her legs. A lifelong athlete, she went on to become the only female to play on a B.C. wheelchair rugby team. Ummm, why are they calling her a quadriplegic? A quadriplegic is complete paralysis of the body from the neck down. She is not quadriplegic she is paraplegic or from the waist down.